“ I have been on a few outrides in my life but nothing could compare to this one. We went right up into the hills and rode amongst game. There was wildebeest, impala, zebra and eland. “ Try trotting when you haven’t quite mastered the rhythm. The one thing which I appreciate about this is that here no crops or spurs are used. These horses are trained with love and appreciation. I have to say this was the highlight of the weekend for both Adrian and I. He went as far as to say that the ride was therapeutic. Juliett Delport and Adrian Delport ( Adrian: PSG & Country Manager at Hewlett Packard). “When it comes to trail riding, Dave Curtis is among the best in the business. Dave has been involved in conducting trail rides since 1980, when he started the Valley of Gold Horse trails. His horses, chosen mainly for their good temperaments, are fully trained and schooled before they are ridden. 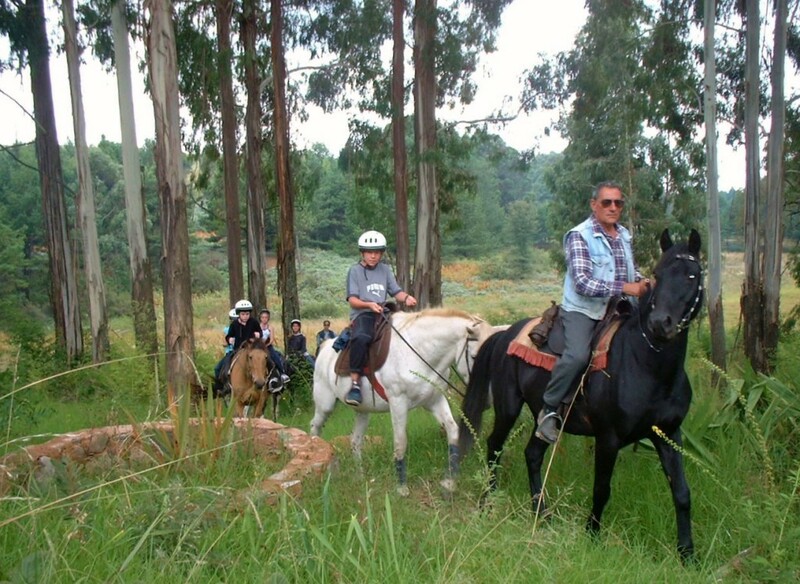 They are also very sure-footed and you don’t have to worry about a horse getting nervous or spooked during a ride – all you have to do is sit back, relax and enjoy the spectacular scenery. The ride takes you through hilly areas where you can view a lot of game and through the greener, low-lying areas with its clean, clear trout dams. The beautiful waterfalls and pools are so serene – the best medicine for any stressed working person. Dave’s first concern is for the safety of the riders. Before mounting any horse, all the tack is checked, the rider is introduced to the horse and the novice riders are given a quick, but thorough lesson on mastering the horse. Dave is just a great tour guide. On the rides, he tells riders about the game they happen to see and can talk for hours on the history of the area. Any novice is bound to dismount after the ride feeling confident and relaxed – just like a seasoned rider. During the rides, frequent stops relax tired legs and bottoms, always a relief after hours of riding. Pony camps are also arranged and are in great demand. Comfortable, custom-made trail saddles, which are more secure for novice riders, are used. They’re also best suited for both horse and rider. Of all the trail rides I’ve done, I enjoyed Dave’s rides the most. As a horse lover, you will immediately feel the relaxed nature of the horses which makes riding with Dave something very special."